The New International Airport of Mexico City (NAICM) should position Mexico as a regional hub and improve its competitiveness. It is scheduled to be operational in 2020 in answer to the pressing need for the expansion of the city's airport capabilities. 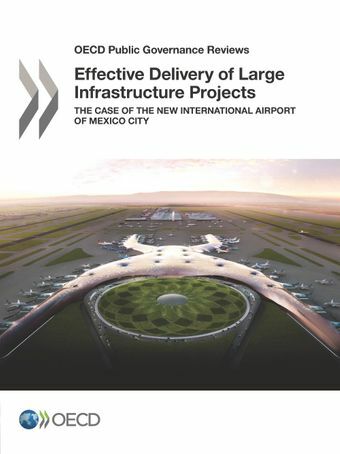 The airport, whose construction is managed by a state-owned entity (GACM), is currently the largest Mexican infrastructure project.A project of this magnitude requires tailored strategic frameworks and actions in several policy areas. Building on international experience, this report provides a comprehensive assessment, and analysis and recommendations in four key dimensions contributing to the effective delivery of large infrastructure projects: governance, procurement, integrity and communication. Governance: a corporatised governance structure could replace the group’s current organisation inherited from traditional public institutions. Multiple implications and impacts necessitate co-ordinated action from different institutions and levels of government and call for systematic stakeholder engagement. Procurement: tailored procurement processes, from thorough market understanding and appropriate assessment framework to comprehensive contract management, could participate to meet the underlying ambitions of the project while not harming efficiency. Integrity: a global integrity strategy applicable to both public and private stakeholders could be implemented to foster a culture of transparency and integrity. It should be overseen by a robust internal control body and opened to external scrutiny to address the high corruption risks of such projects. Communications: regular and targeted messages supported by a comprehensive communications strategy could help secure social and political support throughout the project and align internal and external priorities.